If you give your horse or pony a wormer then you are giving a licensed chemical controlled by legislation. These golden rules will ensure that you give the correct product in a safe manner. If you are at all uncertain of which worming strategy you should be using and which wormer you need to give next then please email us, or call our consultants on 01267 223322, for free advice. Understand what type of wormer you are using or need to use. The only purpose of giving your horse or pony a chemical licensed by legislation is to kill worms. Therefore it is critical that you know specifically which chemical ingredient you are using and why you are using it. If you do not know this then why have you bought that particular chemical and how do you know it suits the purpose for which you bought it. do you use it and when is the best time as it is expensive? Make sure that you have chosen the correct worming interval between wormer applications. All wormers have a time limit on their effectiveness. Eg pyrantel based wormers are 4 – 6 weeks and ivermectin is 8 – 10 weeks. This is one other reason why you need to understand which base chemical you are using. The interval between wormer applications will depend on how much at risk your horse or pony is from worms. If you use the shortest time interval when your animals has a very low worm burden then those worms may become immune to the wormer, equally if your equine has a high worm burden and you use the longest time interval then your horse or pony may be suffering from worm infestation and damage. Make sure that you know your horse or pony’s weight. A weigh tape costs only £7.50 and is the most effective tool in the battle to stop worms developing resistance to the worming chemicals that we use. Visit our shop to purchase one now and it should be delivered tomorrow. If you do not ACCURATELY know your horse or pony’s weight then by overdosing you will be speeding up the development of worm resistance and by under dosing you will be wasting your money on wormers as your horse or pony may still be suffering from worm infestation and damage. If you have a small pony or foal then some wormers can be dangerous and cause colic if an overdose is given. If you have a large horse or pony then many owners just give a whole syringe. This is not always sufficient for 15hh plus heavier horse. Check the weight that the wormer covers. Each wormer, whether it is a syringe, powder or liquid has a limit to the size of horse that it is effective on. With powders this can be as low as 300kg per sachet and with the syringes and liquids anywhere between 585kg and 800kg. Once you know your horse or ponies weight make sure that you give them, in a single application the correct quantity of wormer. It is no good giving a top up the day after if you haven't purchased enough syringes. Wait a day and then give the wormer in a single dose. Check to see if your horse or pony has worms. Every year you investment money in the equines in your care; on feed, bedding, tack and clothing. For £12.50 you can use the veterinary service at the University of Liverpool and have a trained parasitologist, using the latest technology, carry out a worm egg count test to verify that your worming program is working. There are commercial companies offering worm egg counts at half this price but we believe that you get what you pay for. If you are only doing this once a year, and it is so critical to your horses health, get parasitologists who know what they are doing to carry this out for you. If there are problems then they will liase with your own vet on the results, at no extra charge. What is £5.00 for this amount of peace of mind. Minimise worm larvae in your pasture. In a commercial environment it is not always possible to operate any of these recommendations. In this case chemical worming should continue at the shortest interval and a worm egg count taken in May to August to test the effectiveness of the program. Each field can be looked at individually and it is not necessary in a large establishment to have the same worming strategy for each grazing groups. Keep the same base chemical ingredient for twelve months and then change to a different one. Rotate the three main compounds on an annual basis. It is important to keep the same base chemical ingredient for 12 months if you are on a chemical interval worming program. This is to prevent the worms becoming resistant to the wormers. This may happen if you change chemicals every time you worm or if you do not change your base chemical on an annual basis. When the Panacur wormer was introduced in the UK there was no worm resistance to it and horse owners used it year in year out. Now there is wide spread resistance in many parts of the country. This is the same situation as we are in with the Equest wormer now. It is cheaper and easier to use than other chemicals being required only four times a year. However if you use it year in year out then the probability is that the same thing will occur. Wormers are a chemical whose supply is controlled by legislation and the Veterinary Medicines Inspectorate. Any individual who sells wormers has to be a suitably qualified person with the Animal Medicines Trade Regulatory Authority. There are a number of safety requirements that must be adhered to in the storage, handling, dosing and disposal of wormers. It is important to know what you are giving your horse, how to do it safely and what possible side effects there are. Please read the instructions and warnings on each wormer purchased before it is given to an equine. The withdrawal periods of each chemical need to be known due to the introduction of horse passports and the requirements relating to horse meat entering the food chain. These are now listed against each product in our product catalogue. The horse’s mouth must be free of food. Read entire package insert before use. Lock the plunger at the correct weight. 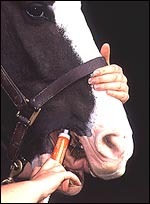 The syringe should be placed between the back and front teeth and the paste deposited at the back of the horse’s tongue. Once paste is given immediately elevate the horse’s head for a few seconds to ensure that the wormer is swallowed. If the horse is difficult to worm then use an easy wormer. Some wormers have an adverse affect on cats and dogs. Any spilled wormers must be cleaned from the floor and used syringes put in a bin with a lid. Do not smoke or drink whilst handling worming products. Store wormers below 25 degrees C.
Ivermectin and moxidectin are TOXIC to fish and other aquatic animals including tortoises and turtles. Do not use if horses are grazing fields with ponds, streams, ditches etc. Some adult strains of worms are resistant to benzimidazole wormers. It is advisable to test for resistance before using either Panacur or Telmin as you routine summer wormer. Mares with foals should be grazed on pasture that has not been grazed by horses for the previous 12months, or at least from Jan to end May. This will help reduce the roundworm challenge to the foal. Equitape is the only wormer with a manufacturers recommendation to stable after worming. This is to reduce the impact on pasture from the praziquantel chemical. This is also contained in Equimax, Eqvalan Duo and Equest Pramox.